Just the item to dress out your scratch built or kit bashed warehouse, freight depot or industrial building. The shee contains three (3) crossbuck freight doors for an 8' x 8' opening. The doors are two part and come attached as a single sheet but are easily split down the center score line to either make single doors or to have one door open. The frames are to be glued on top of the scribed door panels. The doors are cut from a 6 ply cardstock thick sheet so the are an approximate 1-1/2"" thick in O scale when two parts are laminated together. 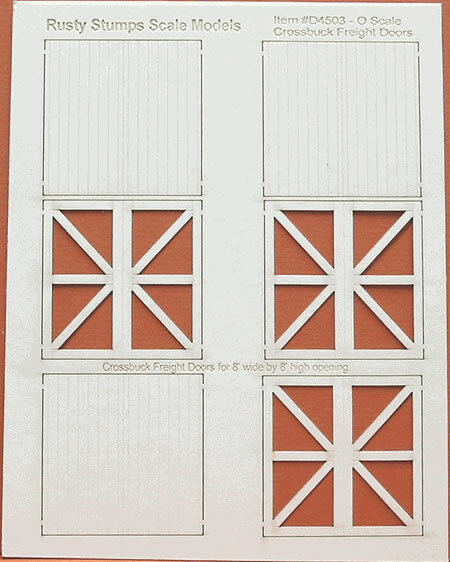 Crossbuck Freight Door 3 8'-0" 8'-0" 2.1333" 2.1333"
Actual sizes show are approximate. You will need to use the actual item to cut the openings properly. NOTE ON MATERIALS: We now offer a choice between CARDSTOCK or RCBOARD. RCBOARD is a plastic impregnated cardstock and is both durable and easy to paint. RCBoard works well with thin mullions but otherwise is very simular to our cardstock material. Excessive wetness can warp this board.